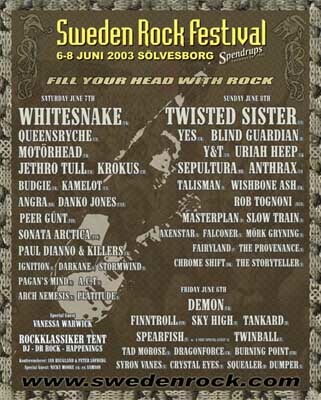 Firmly established as one of the top rock festivals in Europe, this was probably it's strongest ever line-up and the sold out signs had gone up several weeks before the event. Thankfully my friend Chris and I had booked our places months ago and with a car full of beers and food and with the weather forecast promising plenty of sunshine, we had all the ingredients for a superb weekend's entertainment. A bill that would get any self-respecting rock fan drooling at the mouth, you can see why it attracted more than 500 press people and fans from quite literally all over the world. The festival site is set pretty much in the middle of nowhere on the east coast at the base of Sweden and around five miles from the nearest town of Solvesborg. Surrounded by woodland, farmland and the sea, there are plenty of places to go and chill out away from the music - but with such a tasty programme, that is the one thing we didn't have time to do! There are several official free camping areas within a few minutes walk of the festival entrances, as well as dozens of private sites and many enterprising landowners who create their own for the weekend. Many festival goers make do with a scrap of land by the nearby river or forest. Last year the festival Friday was just an evening warm up. This year it had been extended to a full day's bill, giving a three-day programme of 51 bands. After flying in to Malmo Sturrup from Stansted (return flights £40) we hired a car and two hours later we had found a campsite behind a nearby garage (with proper showers and toilets). After drowning a few beers and saying hello to our neighbours, we strolled through the woods for the first part of our three-day musical smorgasbord. 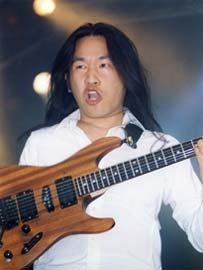 First on the menu for us were Brit metallers Dragonforce. Their brand of symphonic power metal is not my usual cup of tea but their debut album released at the beginning of this year really impressed with some powerful melodies and flamboyant musicianship. I had been due to review them at a recent gig in London but the sound was the worst I have ever heard at a gig in my life and decided I'd give them a second chance here. However crisis struck again when their drummer left just three days before this performance! Full marks for persistence though and determined not to let their Swedish fans down, they brought in a fan from Sweden, gave him two days to learn the songs and put him onstage, having only actually met him a few hours beforehand. Top marks for bravery, however it meant a reduced set and yet again the show was plagued by some abysmal sound. I'm sure ZP Theart is a great live singer but I'm still to hear him properly and for the second half of the set the drums disappeared too. What was impressive were the number of fans who turned out for this set and knew all the words. The final track Valley of the Damned was the only song where the sound was listenable and with a fair chunk of the crowd bouncing around, Dragonforce showed what they are capable of. 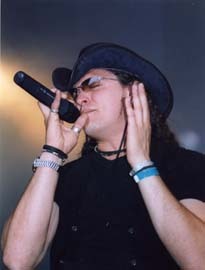 I hope to see them at the Bloodstock Festival in Derby next month - third time lucky? With their vocalist/guitarist dressed in an eye-catching leopard skin suit, Sky High certainly caught the eye and also the ear with some good quality, blues-based hard rock. In effect a classic power trio, they mixed their own material with at least three Hendrix covers. Very enjoyable in the evening sunshine but they came across as more of a tribute band than one making their own way in the world. Tad Morose were the main attraction for me on this first evening. 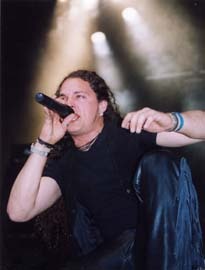 Starting out as a Progressive Metal band, since the arrival of vocalist Urban Breed they have increasingly gone down a more Power Metal field. Playing to an enthusiastic home crowd, in short, they put on a blindingly good show. The set was a good mixture of old and new, that provided a great balance and variety. Onstage they certainly seemed to be enjoying themselves, with lots of movement and smiles. Being more familiar with the Undead and Matters of the Dark albums, it was the newer material that I lapped up the easiest. 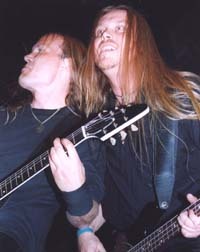 Another Time Around was sensational and then the band was joined by Lefay to reproduce the biting, twin vocals that can be found on the album version of Matters of the Dark. This was a real treat and one that brought total mayhem to the front rows - it's still the only place to be when these sort of bands are playing. Undead too was a juicy way to finish things off with Tad Morose proving themselves to be among the best Progressive Power Metal bands that I've seen. The one thing that most people can agree about Demon, is that the name has to go down as one of the most badly chosen in the history of rock. Say it to anyone who hasn't heard them before and, without fail, it brings an expectation of some loud and grim Death Metal band. The reality couldn't be further from the truth. In a career spanning 23 years, this is a band that has turned out album after album of quality rock with a very identifiable British feel. Now as someone who has long had The Plague as one of my all time favourite albums, I'd been waiting for the chance to see them for many a year. Considering their profile in the UK, the biggest surprise was the following they seem to have in Sweden. I must have been joined by a good 6,000 people - almost certainly the biggest audience the band's ever played to - with the vast majority knowing more of the words than I did. Frontman Dave Hill is the only original member remaining but in a two hour set that spanned their entire back catalogue, Demon showed the consistent quality and wide variety of material they have put out. The most recent stuff (Spaced out Monkey) is almost nu-metal; the early stuff is heavy rock and in between there's a little bit of everything. Remembrance Day with its penny whistle introduction is very folkish, while The Plague would nowadays be classified as Neo-Prog. As expected, the highlight came mid-set when they selected the four best tracks from The Plague. Fever in the City alone still gets the hairs on the back of the neck to stand to attention with its pained passion while two decades after it was recorded, Blackheath remains truly spellbinding. This closed the first part of the set and as the curtains dropped it was funny to see some people starting to leave. They soon turned back when the curtains revealed Hill coming out of a hole in the ground dressed as The Demon before the band launched into a blinding Night of the Demon and an even more rockin' Sign of a Madman. 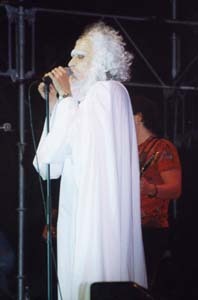 The band even dug into the costume closet to resurrect Father of Time for Don't Break the Circle from the classic Unexpected Guest. It was a shame there was nothing from the Heart Of Our Time album but with a set just short of two hours you couldn't really complain. It was the longest set of the weekend but no-one was leaving until the band played a well deserved encore of Life on The Wire.